TWIN BRIDGES – Town council Attorney Lori Harshbarger had a lot to say at the October 9 meeting of Twin Bridges town council. First, Harshbarger explained to the council the findings of Attorney General (AG) Tim Fox on the long-standing issues between the town council and the library. MADISON COUNTY - With less than two weeks until Halloween, it’s time to stock up on snacks for the trick-or-treaters that will inevitably come knocking on October 31. ENNIS—Brummie Boggus’s love for rodeo began the first time he ever watched a rider on a bronco. Read more about Ride’em cowboy! 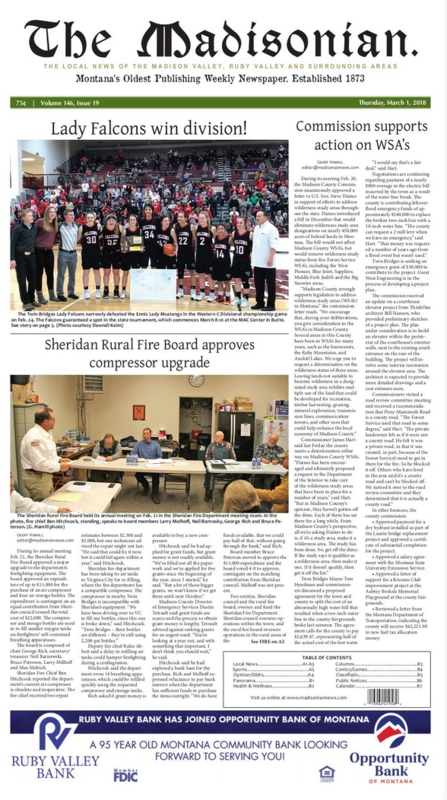 VIRGINIA CITY—At their weekly meeting on Tuesday, October 2, the Madison County commissioners voted to lift the countywide burn ban now that the 2018 fire season is winding down. HELENA – Every Labor Day, the state’s Department of Labor & Industry (DLI) produces a report on the performance of Montana’s economy during the past year, a barometer of the state economy. MADISON COUNTY—Halloween quickly approaches, and horror buffs around Montana are preparing to get their fright on. We put our research minds to work finding the best places to look for spooks both genuine and manufactured. Around 45 percent of Americans believe in ghosts, according to a Huffington Post poll. Are you one of them? SHERIDAN—It’s not common to encounter nearly 500 middle and high school students and have them all be completely silent, but that was the scene for much of Tuesday morning, September 25, at the 47th annual Ruby Valley Invitational, which drew students from Ronan to Colstrip and everywhere in between. VIRGINIA CITY—At its monthly meeting on Monday, September 24, the Madison County Planning Board held a public hearing to decide the fate of a 4.3-acre tract in the Yellowstone Club area of Big Sky. ENNIS—Representatives from the Montana Department of Environmental Quality (DEQ) presented a new document to the public on Wednesday, September 27 that gives information on the health of several streams in the Madison River watershed.